After its huge success, the magnificent museum complex of Santa Maria della Scala in Siena has extended the exhibition, Milo Manara’s Rooms of Desire, until the 9th April. The famous Italian comic-strip artist, here at his first ever retrospective, carries us through forty years of work and passion for comics, with over 300 drawings chosen from boards, panels and original illustrations, enlarged with videos, installations and various other contributions. Siena pays a tribute to the Master of eroticism and one of the most celebrated illustrators in the world. The museum complex of Santa Maria della Scala in Siena has a thousand-year history of hospitality and healthcare, having formerly been a hospice. Strategically built on the highest part of town, right in front of the Cathedral, it was one of the most ancient hospitals in Europe. The hospital was founded by the Cathedral’s priest to house the pilgrims on their way to, and back from, Rome, on the Via Francigena. It also performed charitable work for the poor, including an orphanage for abandoned children. In the 15th century it went under the responsibility of the commune and received numerous donations from the local wealthy families as well as important artistic works of art. Simone Martini, Ambrogio and Pietro Lorenzetti had created on the façade a famous fresco cycle, ‘Histories of the Virgin’, today lost. The Pilgrim’s Hall hosts a series of frescoes with the ‘Stories of the Hospital’ by di Bartolo, Vecchietta and Priamo della Quercia. 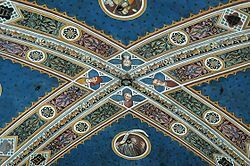 Lorenzo Vecchietta also decorated the old sacristy. Today, while the restoration is still at work, the hospital has been transformed into one of the biggest European cultural centres, and it is possible to visit more than half of the entire area. 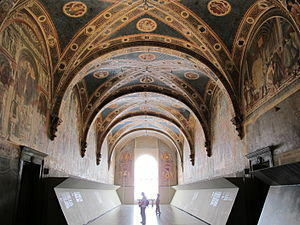 Besides the impressive Pilgrim’s Hall, the various chapels and oratories as well as the Old Sacristy, it is possible to visit the Archaeological Museum, the Art Museum for Children, the Centre of Contemporary Art, the Giuliano Briganti Library and the Photo Library of Art on top of numerous spaces intended to house temporary displays and international conventions. While exploring this wonderful, rambling building, alternating between narrow corridors and monumental halls, maze-like tunnels dug from tuff and large rooms with vaulted brick ceilings one discovers that the historical and artistic testimonies here treasured can be interpreted as a summary of Siena and its history, covering a span of about a thousand years. Siena, an authentic Tuscan jewel. 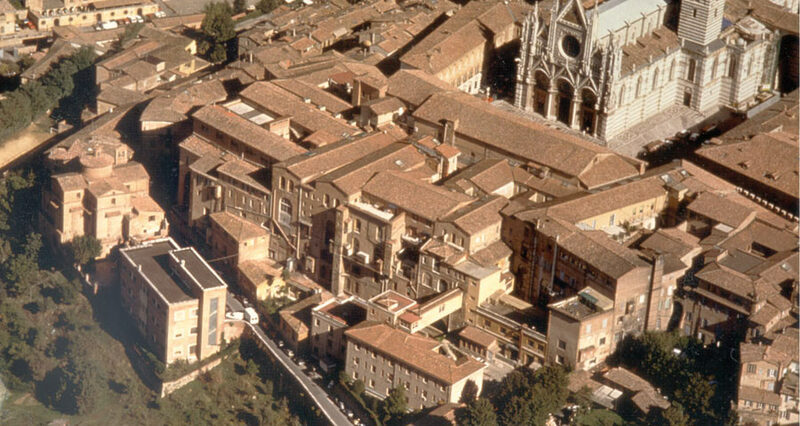 For those planning a visit here’s a link to one of our holiday accommodations in Siena.